New this summer to the Charles Viancin line-up of food covers are some fun new styles! Including watermelon, crystal cut, hibiscis, grape leaf and more. We have lots of new colors in silicone heat pads as well. Stop by our Housewares Department for the full selection of Charles Viancin products. Storing Food – use them in the refrigerator to contain food odors and to create seal that is airtight around any glass or metal pan or container. These food covers are reusable and more convenient then messing around with wax paper, aluminum foil, or saran wrap. Serving Food – use as quick and simple covers over casseroles, salads, and other serving bowls. 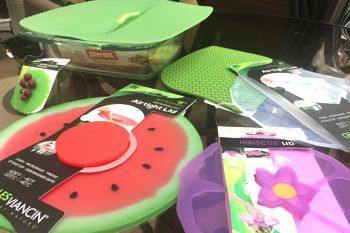 The silicone covers keep bugs out of food and makes for easy removable when serving. Great for buffet tables as well. Heating Food – use on the stovetop when heating up sauces and other foods that may splatter lots. Also, use in the microwave to prevent messes. BPA free and microwave safe. Stop by and see our full assortment in our Housewares Department. We have food covers in many different sizes from small to extra-large. We also have wine bottle stoppers that are fun and functional. Great for parties and great for gifts.